Why 12V? Because 12V is what you use to power almost all of your devices! In most cases, a 12V power source is already up on the telescope. This eliminates 1 more cord that can get snagged when the mount slews. Unpowered hubs just don't work! Some mounts feature a built-in USB Hub, but we have yet to see one that is powered. Considering the number of USB devices and the length of the USB extension cable, data transmission and power for your USB devices just isn't going to happen unless the Hub is powered. 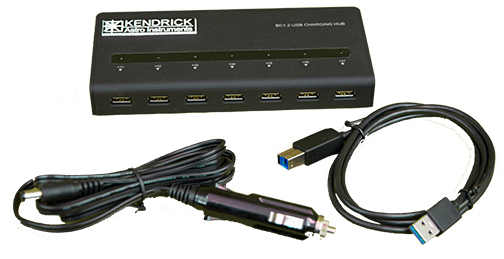 The Kendrick active USB Hub is powered from 12 vdc, and to the best of our knowledge, this is the only hub of its type in the world! This hub has been designed primarliy for use by astro-photographers but this it will appeal to anyone requiring a USB hub in a field operation or permanent observatory situation. Standard desktop hubs are designed for use indoors and must be powered from 120 volt or 240 volt mains electricity. For anyone requiring the use of a USB hub outdoors or in a remote situation where access to mains electricity is difficult or impossible, this device is a welcome addition. For astro-imagers, the use of a hub at the scope helps reduce wire routing and tangling problems. We use a small heater inside to keep things nice & dry! DigiFire 8/12 DC Accessory Port (optional power cord available). 12 volt power cord (non locking) that terminates in a cigarette lighter plug. Other cords also available. *Longer USB cables are available for purchase (10' and 15'). A small heater inside keeps plugs nice and dry! This is an active hub. Optional port dust covers. Great for use in unused ports and for storage. Keeps your ports clean and moisture free! Includes velcro to attach to a surface of your choice.